There's been a lot of talk about food trucks lately. Redding and Anderson are both looking at putting in food truck parks. One of my daughter's favorite shows is "Food Truck Face Off". Even my neighbor had a food truck in her driveway when she had a party. They are everywhere, and yet I can't ever find one when I want something good to eat. 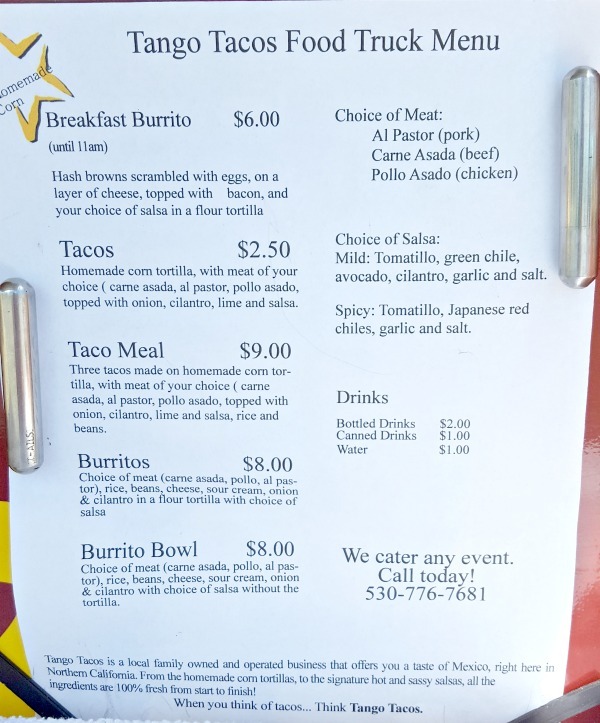 Does Redding have any "real" food trucks? And if we do, where are they? Well, folks that's my quest; to find food trucks and bring them to you every week (well...most weeks) this summer in what I (not so originally) named "Food Truck Friday"
I used to think food trucks were SK.ET.CH.Y. And probably some of them still are, but what I've learned over the recent years is that some of the best foods are produced in a truck (or trailer). But so many questions come up when eating at a food truck. Will they only take cash? Where do I sit and eat my food? Do I want to stand in line outside when its 100 million degrees this summer? What if the food isn't any good? Will my kids eat there? Well, over the next several weeks, I hope to answer all of these questions. First up for Food Truck Friday is "Tango Tacos"
Tango Taco's Facebook Page states, "Tango Tacos is a family owned and operated business made with fresh ingredients from start to finish. 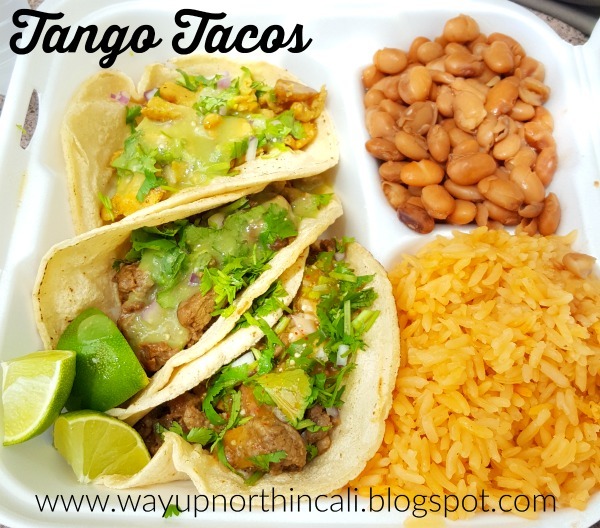 From the homemade tortillas to the signature "Sassy Salsas," your mouth will savor the "Tango!" Now that I'm off work for the summer, I'm taking full advantage of being able to go to lunch with my husband. So I picked Q up from work and we headed over to Lowe's shopping center for our very fancy food truck lunch date. Sorry, terrible picture. I'm going to get better at this, I promise. We ordered and from the menu posted on the side of the truck and waited about 6-7 minutes for our food. In the mean time, we scoped out a place to eat. You see that picnic table that guy is sitting at in the first picture? Well, those are actually tables that Lowes is selling, and that guy and his two friends got there first, so we needed to find a different place to sit. But that's the problem with food trucks in a parking lot...there isn't anywhere to sit. So I imagine most people take it "to go". But, I was on a fancy food truck lunch date with my hubby, so we found a planter (that didn't have any plants in it) next to a motorcycle with a tiny bit of shade. After checking to make sure there were no bums hiding behind the planter (sigh...) we took our seats. Q ordered: The Taco Meal. It comes with 3 tacos, rice and beans. Q decided on two beef tacos (one with mild salsa and one with spicy) and once chicken taco (with mild salsa). The guy taking our order promised the spicy salsa was "extremely spicy" so Q went conservative and ordered just one spicy, but he said it wasn't "that" spicy (meaning it would have burned my mouth off, but is just fine for Q). I ordered: 2 tacos, one chicken, one beef, both with mild salsa. And we each ordered a bottle water. Total cost for both meals: $16 (I paid with cash to avoid the card fee). I was definitely satisfied with my meal. The tacos were very juice and little messy (the best kind always are) and of course DELICIOUS! If I had to pick, I think I liked the beef better, but would probably still get one of each when I order again. We will have to try the pork next time too. Two tacos filled me up, and Q decided that while he liked the rice and beans, he could have just ordered the tacos and been filled, but bigger appetites will definitely want the meal. The people ahead of us ordered burritos and they looked hefty! And someday when we are starting a home improvement project early in the morning, I definitely want to try out one of those breakfast burritos! 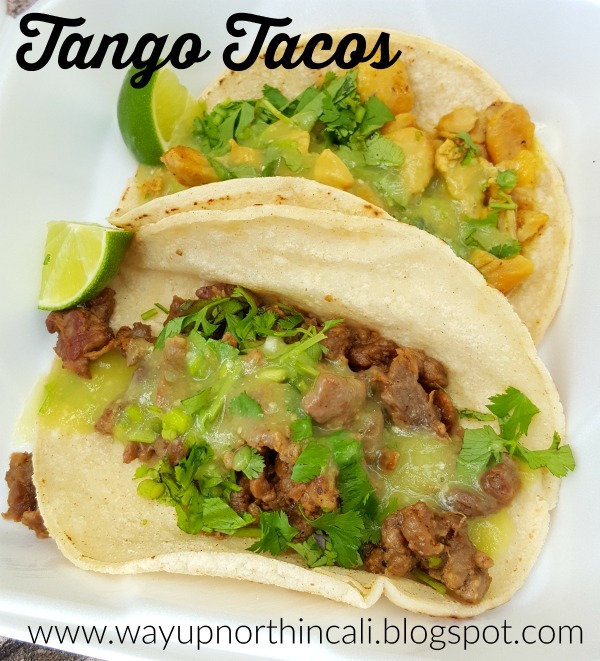 Bottom Line: You should definitely check out Tango Tacos! Well, there you have it. 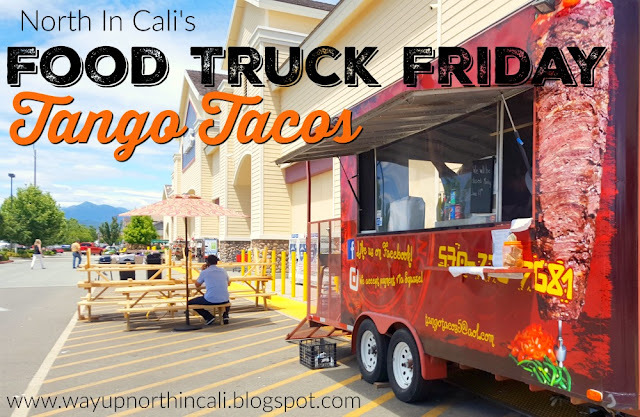 Our first Food Truck Friday post. 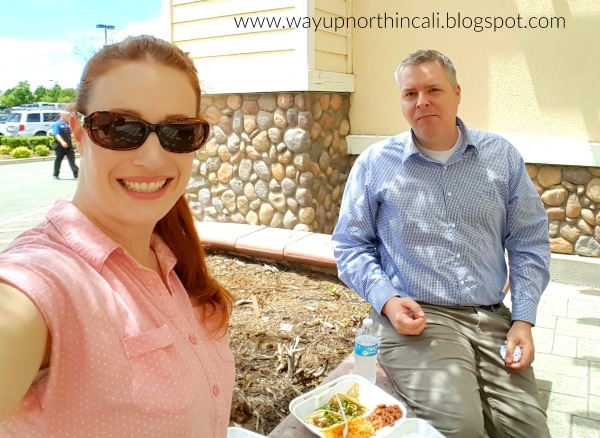 Do you have a favorite food truck in Redding I should try. Leave me info in the comments!